In SimCity, many people think the goal with traffic is to get it to be completely free flowing. Realistically, you just want to avoid gridlock. Heavy traffic is okay, as long as it's still moving. If you're getting a gridlocked city, it's probably due to your layout and the distribution of RCI. Here's a few tips that Jaime Ramsey came up with to help in avoiding a gridlocked city. 2. Commercial zones provide both Work and Shopping meaning you'll get twice the traffic around these zones. 3. Bridges and tunnels can be used as shortcuts from one zone to another. Also, pedestrians will walk along streetcar tracks so they can be used as pedestrian shortcuts even when streetcars aren't being used. 4. Sims take the shortest path. If a dirt road is shortest then they will ignore an avenue. 5. Don't clump your services in one spot. This creates a traffic jam around those buildings and makes them more vulnerable to disasters. 6. If you are going for low wealth only, don't build colleges or universities as this can cause development problems for industry. 9. Airports don't need runways to unlock the various service helicopters. 10. The most basic RCI ratio for a balanced city is 2:1:1, which you will need to tweak for various densities. 11. R and C should be close together to encourage walking to complete the Tip#1 cycle. If not, make sure there are dedicated paths connecting the zones for each part of the cycle. 12. A clinic near or in the main industrial area and another in the Residential/Commerical area works best. 13. Police stations need to be in or near the main commercial zones. 14. Educate early to head off problems with health, crime, and fires early. It really pays off. 16. School buses serve all schools in the city. That means the more buses, the higher chances of bus clumping together. 17. If you have a city with oil under it, you can use the Oil Service Road trick to provide a network of shortcuts for your trade trucks. 18. Don't worry about traffic being colored red unless you have gridlock. As long as the traffic is still moving, you should be ok.
Do you have any other tips that help keep traffic flowing? Leave a comment and we'll add it to the list. About point 15: Is there anything to back this up? As far as I am aware, you only need 1 type of education-giving building, the only difference is their desk capacity, whether they have school buses (or the students have to make their own way there), and whether they produce technology or not. In my experience, it is fine to just have a University and nothing else, as long as the Kids can make it to the University in time for the classes, given your transport system that you have in your city (walking, car, or mass transit). As long as they can get there, they get educated. Why would you need 3 types of education building? About point 20: You don't need filtration pumps. At all. The only reason you would have to use them is if you allowed your sewage treatment centre to overflow for a long time, causing ground pollution, or if you place your water pumps right next to Industry or other ground-polluting buildings. Neither of these is a good idea. I have played many cities using this 'unlimited water' trick, and I have never put even a single filtration pump in (and I still have 100% clean water). It's a waste of money. I have to agree with you on #15. I do fine using only community colleges. Hadn't heard that about #20. 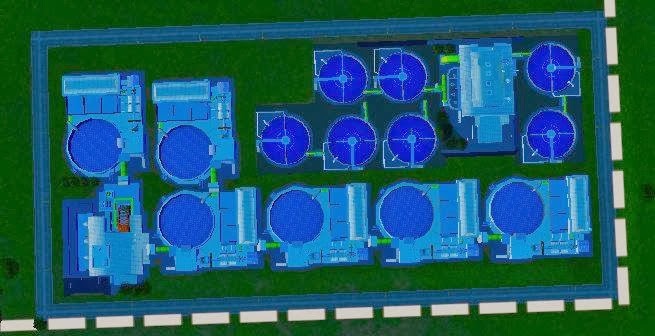 I usually add the filtration as well, however I do like the ability to place them anywhere I want (next to industry, garbage dumps, etc) which the filtration pumps help with. Thanks for the tips! Another config is 450x780 with basic water pumps placed vertically perpendicular to the roadside and just one basic pump at the top. Avoid stoplights wherever possible. You can do this by making a terminating road to an avenue a dirt road immediately prior to the juncture. If you must have two main avenues connecting, try to only ever have t-junctions, not 4-way junctions. If it looks like you might end up having a 4-way junction despite your best efforts, use under and over passes to make sure they don't meet and you don't end up with stoplights, then add dirt roads to interconnect the main crossing roads just shy of the crossover point.